Q. How do I return an audio book from my bookshelf prior to the end of the lending period? 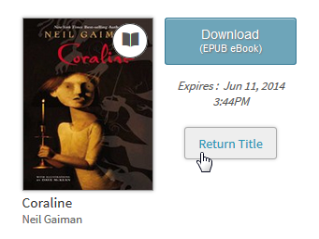 If you've borrowed a digital title, but have not yet selected a download format, you can return it early from the bookshelf on your library's digital collection website. Note: Titles are automatically returned at the end of the lending period. To return a title, click or tap the Return Title button. If you select a download format, the Return Title button disappears. If you finish an MP3 audiobook early, you can return it before the end of the lending period using OverDrive Media Console (OMC) for Windows. Note: This article is about the desktop version of OverDrive Media Console for Windows. If you're using Windows 8 or RT, and have installed OMC for Windows 8 from the Windows Store, please see this article on how to return downloaded titles using OMC for Windows 8.